Farmers know the old saw, 'fresh fruits and veggies are too expensive' but a USDA study says they aren't. This week USDA's Economic Research Service released a report that breaks down a long-held myth that says unhealthy foods are cheaper than healthy foods and that's the cause of health problems and obesity. Many diets fall short of Federal recommendations due to this challenge and nutrition researchers and food writers have blamed cost. Andrea Carlson, of ERS, and her colleague Elizabeth Frazao wanted to look at other price measures beyond price per calorie as a beginning point to answer the question of whether price is a hurdle to making wiser food choices, They calculated price in three ways: price per calorie, price per edible weight and price per average amount eaten. POUND FOR POUND: When measured by edible weight or portion size, healthy foods are less expensive than protein and other sources. They looked at 4,000 foods and sorted them into five categories - dairy, grain, protein, fruits and veggies. "Less healthy category foods and those high in saturated fat, added sugars and or sodium were left out," Carlson says. What they found is that you can always find inexpensive healthy food no matter what metric you use. Of the five food groups, vegetables came in more expensive than meat, fruit was in the middle, then dairy and finally grains. There is always a range of prices including less expensive healthy items and more expensive healthy items. Consumers need to be aware of how the price is measured and if it tells about eating a healthy diet. 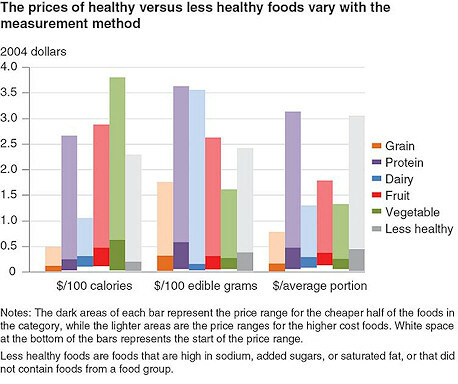 Healthy foods are not more expensive than less healthy foods. This chart shows how meauring healthy foods using the right criteria can pay off on the long run. Essentially, the report shows that smart shoppers will win out if they keep measurements correct. For grains, vegetables, fruits and dairy foods, the price is less expensive than most protein foods and foods high in saturated fat when the price is measured for edible weight or average portion size. The chart on this page offers added detail. Or click to check out the whole report.